THE MOST SEARCHED for term on Google in Ireland in 2016 was ‘Euro 2016′. The result is contained in a list of Ireland’s top searches listed by Google for the year just passed. 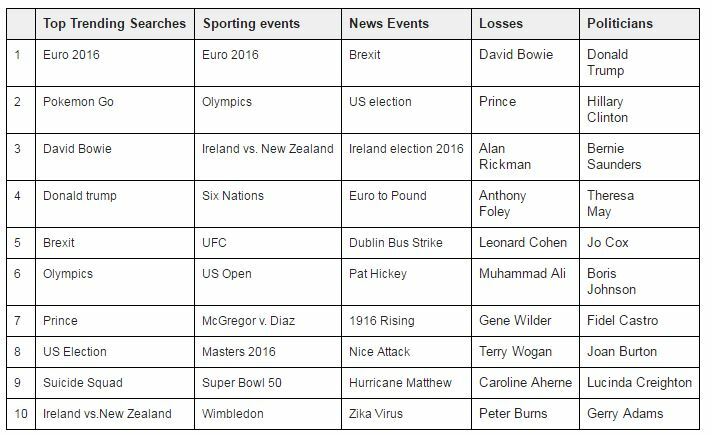 The top searched-for news events in Ireland were Brexit, the US election, the Irish election from February, and ‘Euro to Pound’ (which is most likely also a Brexit-related search). The most searched-for politicians meanwhile were Donald Trump, Hillary Clinton, her Democrat rival Bernie Sanders, new British Prime Minister Theresa May, and murdered UK Labour MP Jo Cox. Famous faces who died became something of a sad recurrence in 2016, with musicians David Bowie and Prince, actor Alan Rickman, and Munster rugby legend Anthony Foley the top four searches in the ‘Losses’ category. Steven Avery (from Netflix’s Making a Murderer) was the most searched for man, with Bruce Springsteen and Conor McGregor close on his heels. 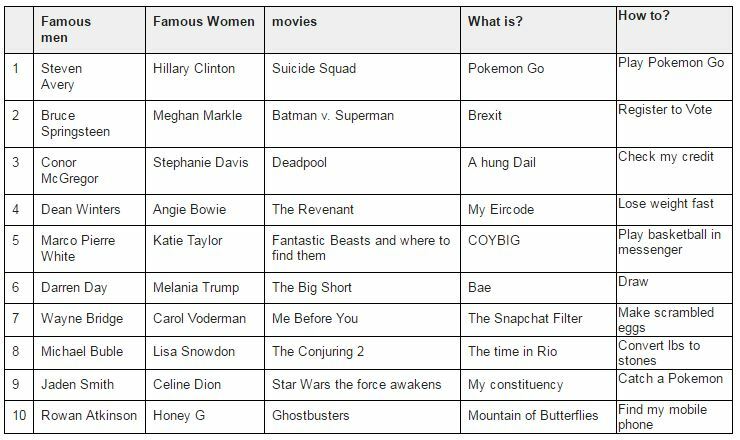 In the female category, Hillary Clinton was the top search, followed by Prince Harry’s girlfriend Meghan Markle and former Hollyoaks actress Stephanie Davis. The most searched-for movies of the year were Suicide Squad, Batman vs Superman, and Deadpool. Finally, two of Google’s most popular search terms are ‘What is?’ and ‘How to?’. The top five ‘What is?’ searches were: Pokémon Go, Brexit, a hung Dáil, my Eircode, and COYBIG. The popularity, certainly initially, meanwhile of augmented-reality game Pokémon Go is confirmed by the top five ‘How to?’ searches with Pikachu et al topping the poll once more. Those top five searches were: play Pokémon Go, register to vote, check my credit, lose weight fast, play basketball in messenger. Email “Here are the things we Googled most in 2016 - can you guess what made the top spot?”. Feedback on “Here are the things we Googled most in 2016 - can you guess what made the top spot?”.